This raincoat is just too cute to save for a rainy day. Giveaway time! Remember those amazing outfit inspirations from last week? Well, now all of those shoes can be YOURS. Enter the #DSWshoehookup Summer Lovin' Wishlist Pin to Win contest for a chance to win $250 in free summer shoes! You can find all the details to enter here. Good luck! White and blue are just your colours! Love the look's colors! The baby blue maches perfectly with the white. Maybe its just me, its a little pale... but you look stunning! This is a gorgeous colour combination. Love the accessories. That pale blue is such a flattering color for you! Such a stylish raincoat and perfect pumps! so pretty, love the colors.. Such a cute look. Love your jeans and blouse. Those are some of the prettiest blue heels I have seen in a long time! The shade is perfection! 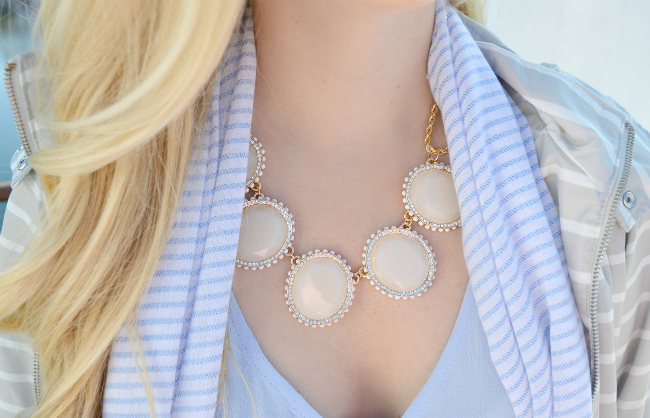 Love the combo of light blue and white! So summery and fresh! Those blue heels are the cutest! I love all of the blues together!! I wanted to buy that raincoat but the sleeves were too short on me :( Super adorable on you though. Great casual look for the weekend. Hope you had a wonderful time with your mom on Mother's Day. How is she feeling? Adore this look, the scarf is darling! Cute outfit :) love babyblue for spring. Cute look! 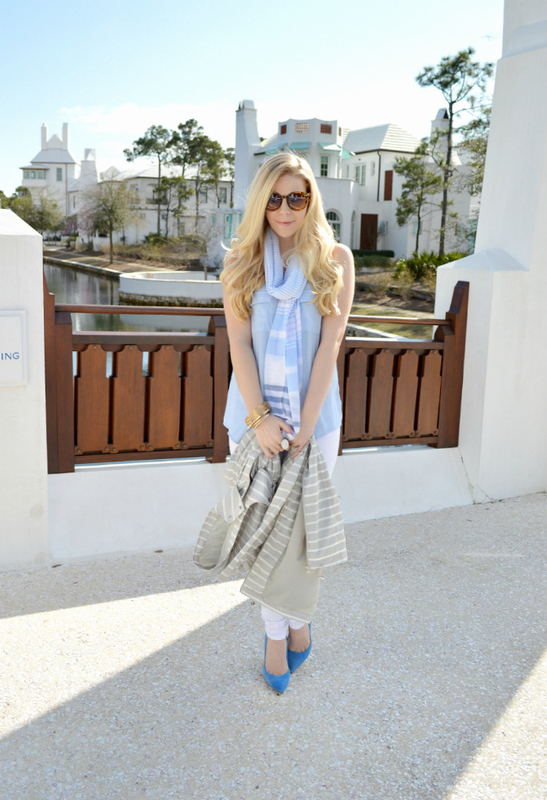 Loving your pumps and scarf! Such a fresh look- love the rain jacket! This is so pretty! I love that scarf! There is nowhere that I love more than Alys Beach! Beautiful photos... 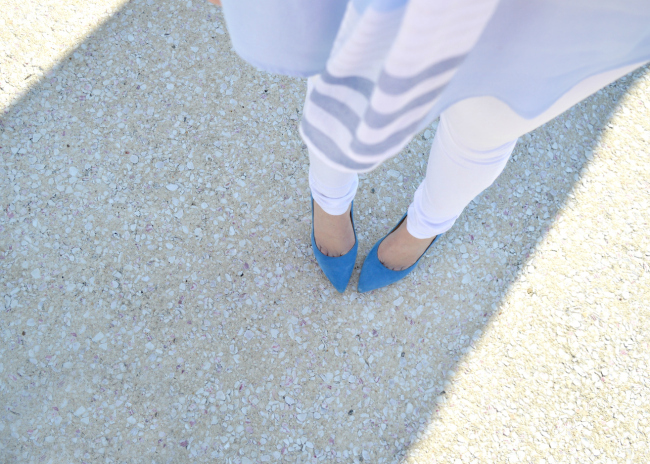 I wore similar blue heels on my blog last week. Such a lovely pop of color. Fabulous look! A perfect spring look. I love the raincoat. Gorgeous ! Loving the pastel blues. If you have a min id love to hear your thoughts on my latest outfit post. Wonderful inspiration for a chic everyday look, when the mood gravitates towards dressing up. Amazing color choice!! I love pastel blues, and they look wonderful on you! This color looks beautiful on you! Love your necklace too - great summer combination! You look very ladylike and poise. These sunglasses are amazing and I love the shoes! beautiful style my dear. I always love blue. Your shoes are pretty amazing. This entire outfit is stunning! You are stunning! Love it all! That necklace is darling! I love this look! Especially the sunglasses and earrings! This look is lovely! I am totally crushing the scarf. 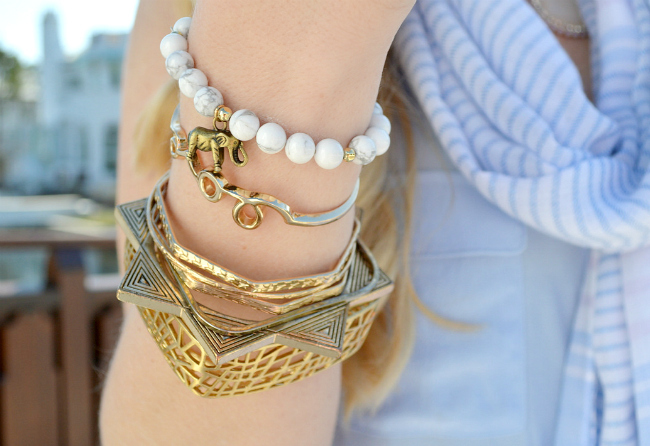 So smitten with your pastel colors and gorgeous stack of gold bracelets. 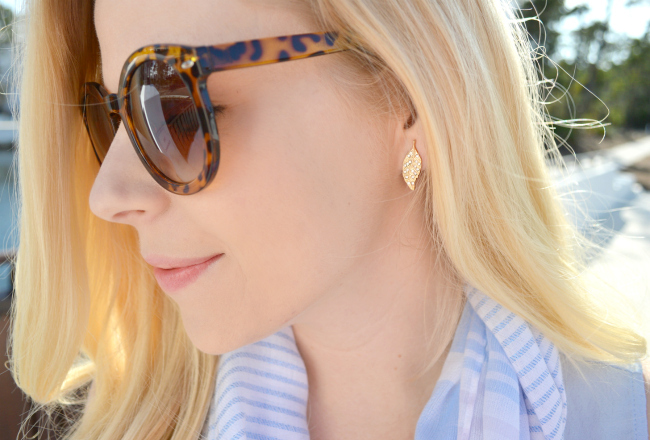 The little gold leaf earrings could not be more perfect. Wow, this is such a beautiful outfit. It's so fresh! I must now get a baby blue shirt to rock with my white bottoms.